Leather protector gloves should always be worn over Rubber Insulating Gloves to provide the necessary mechanical protection against cuts, abrasions and punctures. It is the responsibility of the purchaser to specify the overall length of the protector gloves. 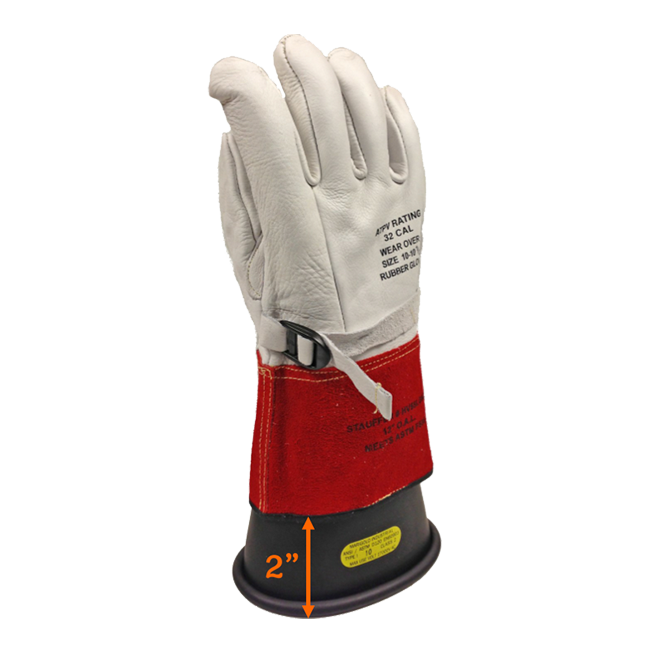 The Clearance Table (see pdf) shows the minimum distance which shall be allowed between the protector glove cuff and the bead of the rubber glove per ASTM F496 Specifications. As with the rubber insulating gloves, proper use and care of the leather protectors is essential to user safety as well. Prior to each use inspect the leathers to remove any metal particles, imbedded wire, abrasive materials or any substance that could physically damage the rubber gloves when used together. WARNING! Do not use leather protectors alone for protection against electrical shock. Serious injury or death will result. Always use a properly rated insulated glove for the voltage being worked. All Cementex Leather Protectors meet ASTM F696 standards.